The typical timeline for commercial real estate transactions is roughly 60 days. However, if you’re planning to relocate your business or buy a new building, you’ve probably spent longer considering your decision. Moving a business is a significant financial investment and time commitment. So if you’re serious about relocating, do yourself a solid and leave no stone unturned. Below are seven must-dos when considering a move or purchase, which can help streamline a predictably intricate process. Start with the basics. Consider the impact that any new physical location will have on your company’s operations. Where do most of your transactions occur? Businesses that depend on walk-in customers, such as retail stores, salons or casual restaurants, may see immediate changes to the amount of foot traffic that their new location receives. Utilize location-based data to measure changes in foot traffic for a complete snapshot how a change of scenery will affect sales. From an operational standpoint, any change to your physical location can have a significant impact on employees. Moving to the next town over, or even to the other side of the highway will be convenient for some and a hassle for others. Unfortunately, this will lead to some tough personal decisions for your staff. It’s estimated that the cost of losing an employee can range from tens of thousands of dollars to 1.5-2x the employee’s annual salary. Employee turnover is a costly expense that should be factored into your decision-making process. When purchasing a new vehicle, you wouldn’t buy a two-door sports car if you have twins on the way. Use the same thought process when considering a move. Think ahead, and project how growth will expand your needs. Sure, some businesses may choose to pursue intermediate loans that last three years or less, but long-term commercial loans can last five to 20 years. Ask yourself: Will this space accommodate our business in a decade? The last thing you want to do soon after making such a sizable expenditure is lease space across the street because you’ve already outgrown a new facility. Large business decisions are team efforts. You hired folks to head their respective business functions, let them do their jobs, keep them in the conversation, and listen to their concerns. For example, it’s important to have your head of finance, or accounting department looped in. Your banker will have questions that only the company’s financial savant will be best positioned to answer. The head of sales is the best spokesperson for the structure of revenue streams. Don’t forget the head of operations, who can answer questions about how well your company has solidified its vendor relationships and mitigated risks in its supply chain. Don’t be a hero and attempt to shoulder this burden by yourself. Not only is it unnecessary, but could put you in a position to miss important checkpoints. Once you’ve conducted a thorough assessment of the new location’s impact on your business, it’s time to seek out financing. Consider your banker as another vital team member. It’s important to understand that your banker wants to believe in your ability to be successful, so he or she can do everything possible to help you secure the right loan. Before a banker can approve or deny your loan, it’s crucial that you to speak to your current financial performance. This includes cash flow statements, revenue projections, profit and loss reports, and balance sheets. The goal is to give bankers the full picture of how financing fits into the equation. Assembling a complete loan proposal is crucial to getting any lender’s approval. How does this new debt fit into your plan? Stem Ciders, a Denver-based craft cidery, is a great example of a company that came into the lending process prepared with an impressive loan proposal that outlined a solid vision of how they planned to expand their distribution, production operations, and mitigate risks involved. 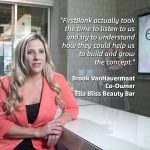 As a result, FirstBank helped Stem Ciders secure the necessary funding to expand their operation to a $7 million facility in Lafayette, Colo. This new location not only satisfied their current demand, but provided the capacity to grow production to 100,000 barrels, which translates to about $43 million in sales. Their continued success is a testament to what happens when preparation meets strong partnerships, which is exactly what your business should strive for when approaching any potential lender. Before you sign on the dotted line, it’s important to understand the significant financial commitment you are making when you take a lease. For business owners, signing a lease is just as equally significant to taking out a loan. We’re talking about a sizable and lengthy debt obligation, with substantial costs if you back out of that commitment. Though business owners are often worried about losing out on an ideal location, committing to a lease is not something you want to rush. Sweat the details first, sign it second. In terms of your financial preparedness, having all of the puzzle pieces together will benefit you in the long run. If planning to move, most people know to allocate funds for movers. But when it comes to the hidden costs of relocation, the devil really is in the details. This is especially true if you are planning to make improvements to the new space. Start with local municipalities, as they’ll need to sign off on any cosmetic or full-scale improvements. There are likely stipulations and requirements that must be met before getting their approval. While these can be the responsibility of the building’s owner, they can also fall to a new tenant like you. Find out the relevant municipal codes to your planned upgrades. Know whether your new facility is in a “business-friendly” municipality. Anticipate the risks associated with due diligence, such as permitting and environmental factors that can cost significant time and money. The decision to relocate or purchase new real estate needs to be taken seriously. Take your time and thoroughly prepare. When you finally approach a lender, the groundwork will be laid for a strong partnership and a successful move.